Once you have chickens, you no longer need to rototill! and you'll be ready for a garden in no time. Check it out -- this is after just one afternoon. Buffy's taking a water break. You've got to stay hydrated to do good work, after all. Specky started clearing this in no time flat. Look at the great job she can do! She quietly goes about her business, with impressive focus and stamina. They all have excellent attention to detail. But after a hard day's work in the gardens, a girl needs a good rest and a good bath. And if you're a chicken, you need a dust bath. The girls create these little hollowed out places to roll about in. They take their wings and fluff as much dirt up into all of their feathers as they can manage. They literally get as dirty as they possibly can. It might look like it's all just chicken fun and games, but it's really good for other reasons, too. A dust bath a day keeps those mites away! When they've lounged enough in their little dust nooks, they get up and shake it all off. It creates a big poofy cloud of dust for a moment (reminiscent of "Pig-Pen" from Charlie Brown). It's a real hoot to watch. Life is good in my favorite spot. 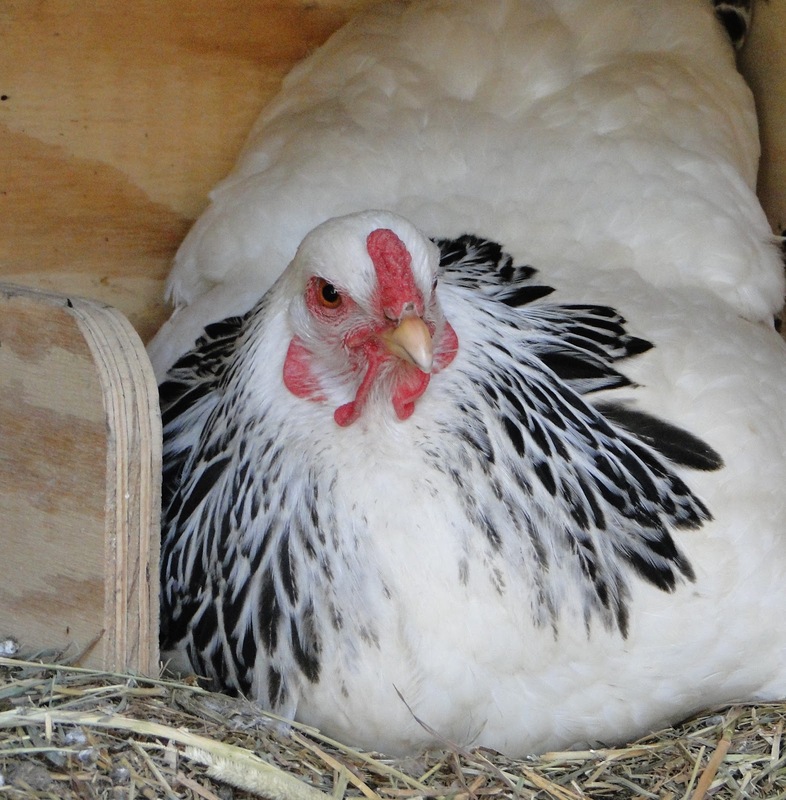 Just chillin', waiting for that egg to come on out. Except some days my sisters come in squawking at me. They want to lay their egg, too. Sometimes they try to bribe me. Not even for some extra mealworms, I say. Not even for a better place on the perch. when they step on me, and try to nudge and budge me aside. This is my spot, I say, in my important voice. I don't like it when you try to budge and take my spot. I want you to please stop. Nothing's going to ruffle my feathers. I will stay in control. I will take deep breaths. I will count to 10. If nothing else works, I will get help if I need it. Some elementary school humor - I just couldn't resist...! All silliness aside, in the end, our Brahma stood her ground! (sort of like some kids really want to be in the very front of the line and hate anything else). NO WAY, NO HOW was she going to give up her spot! You get a sticker and your sister gets a sad face! First of all, there's the word itself. I had never seen a mezuzah before I met my partner. At first I thought it was just some funky decorative thing she had on all of the doors. they all lean in the same direction. different groups of Jewish people couldn't agree on which way it should be hung. So they compromised and it's in the middle, with the top pointing in towards the house. and putting one on your door is supposedly a mitzvah (i.e. good religious deed). The scroll inside has a Hebrew prayer called the Shema on it. by a specially trained scribe with a special quill with special ink on parchment. That's a whole lot of special. and then kiss their fingers as they leave or enter their home. Many mezuzahs often have specific symbols on them. There's the shin and the chamsa, both visible on this one above. The shin is the top symbol + may have multiple meanings from what I've gathered. and the Jewish people are to love God with all of their heart. The lines of the shin also resemble the 3 valleys in Jerusalem. The chamsa (or hamsa) is the upside-down hand, 'The hand of Miriam' or Moses' sister. It's a sign of protection against evil (note the evil eye in the center of the hand). Other religions and cultures use a similar hand symbol, as well. very liberally and simply, to mean that the home is blessed. I like the idea of blessing each space, so we have some on our interior doors, as well. into a beautiful object that you'll see as you come and go each day. So maybe there's no such thing as a lazy gardener. or at the very least, a labor of wanting to eat. But if there is such a thing as a lazy gardener, I am it. planning what amazing things I could do. is that we just don't have any really prepared areas in which to grow anything. We're working on that this year. Maybe next year we'll have created "room to grow." and this looked like as good a spot as any! Pressure treated lumber contains arsenic and will leach into your soil. Last time I checked, no one really wants to eat arsenic. Kind of defeats the purpose of growing your own vegetables. So, have your soil tested if you want to eat anything that's growing right near pressure-treated lumber. Here's some space in the front flower gardens where nothing has come up yet. I guess we'l﻿l have to wait and see if my laziness will work or not! the way they roost on their perch at night. 5 girls on the left and 2 girls on the right! Life is changing all the time, but it's so evident in the earliest spring. The world gets greener by the minute. and it's like a different place. Such clear evidence of how dynamic and truly alive everything is. in little sweet spots, all over. The process of food preservation has always entranced me. The steam. The bubbling pots. The shiny jars all lined up in rows. It's a magical alchemy of sorts, invented in the kitchen laboratory. I pit and peel, hull and husk. I gather jars, fetch tools, prepare shelves, write labels. between earth, sun and water. A given plot of land, and the seed that was tended there. The hands that did the tending and harvesting. I get sentimental when I walk down into the basement in the barren months. wishing I could step back into those moments, just for a little while. Not that I don't love to be in the present moment. But I can do the next best thing. Open them, savor them -- eat them! and know that they will come again. when I will be so grateful. I love most of all how things transform. it's like there are wings involved, some sort of flying. rows and rows of tomatoes, suspended in time. + puttanesca sauce and shiitake marinara. San Marzanos make the sweetest sauce, we all agree. See, we have a little bit of a problem. We love to stock up for the winter. We fill up the shelves, like chipmunks hoarding a store in their underground units. We are nutty about it. and more rows than this of still very full shelves. Clearly we overestimate how much we need. if there's any disaster involving food shortage and survival, this is the place to be. I think they think we're crazy and we probably are. We should plead temporary jamsanity. Who needs this much jam?! These shelves go 3-4 jars deep and are stuffed with jams, jellies, and chutneys. But that doesn't seem to stop Bootsy from making it. Maybe she is addicted to the magic of preserving, giving food wings. I'm going to have to hide the canner. And we're making do with this as our little farmette. as we're able to get on our little 1.92 acres. Meet our sleepy flock of sheep and the friendly resident horse, Vicki Adaire! And the obvious bonus: there aren't any chores or vet bills!